There is a growing misunderstanding today in Christian circles where God’s pleasure in us is being linked to His acceptance of us in Christ. These two are very different subjects. While everyone who has come to Christ in faith is 100% accepted in the Beloved, we are NOT always well pleasing to Him. Fortunately, this topic is very easy to understand and clarify from God’s word. “Accepted” is term associated with relationship. Even in English, our notion of being accepted by God means that we are approved by Him. This approval finds its expression in a state of relationship with God due to Christ’s redeeming work. Christ not only redeemed us (bought us back – paid the price for us), but has and is generating a trustful reliance in our hearts that we are now accepted by the Father through Him. The word “accepted” here is the Greek word charitóō and usually carries a slightly different meaning. In this case however, charitóō takes on the meaning of being objects of grace. In charitóō there is not only the impartation of God’s grace, but also the adoption into God’s family in His imparting special favor towards us in Christ. So in this one word we have a wealth of information and revelation of God’s love and provision for us. Grace is God’s influence over our hearts. It is the means by which He leads, guides and directs us. This word charitóō tells us that God lovingly directs and influences our hearts to trust that through Christ we have special favor with Him as our Father. This places us in relationship with God and fully, 100% accepted by Him even as Christ is accepted! How wonderful and amazing is that? So it stands that by the work of Christ we are accepted by God the Father and therefore, enter into relationship with Him as dear children. Pleasing, on the other hand, is a word which focuses on actions which are consistent with the nature of a relationship. 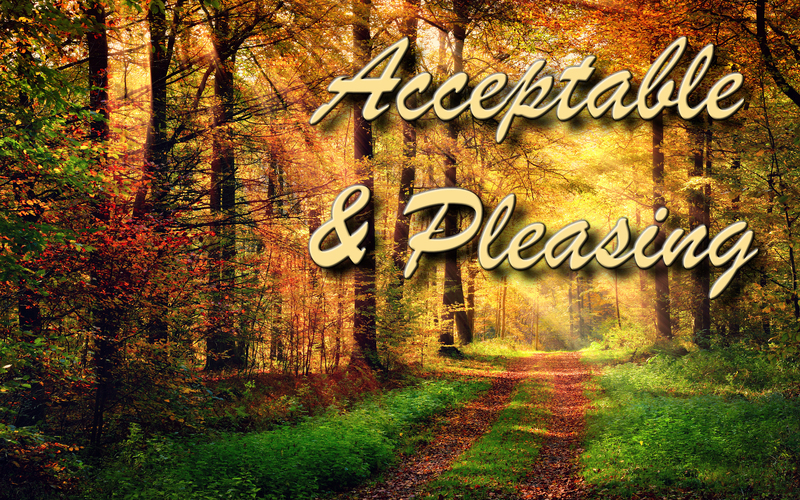 The very use of the word “pleasing” denotes a relationship which is already in place…an acceptance which is already enjoyed. Without a relationship of knowing and trusting, this word scripture uses for “pleasing” God, can have no meaning. In Rom. 15:1-3; Gal. 1:10; 1 Thess. 2:4 it means to seek to please or gratify, to accommodate oneself to. The present and imperative tenses denote intentional, deliberate, and continuous conduct and therefore separate themselves from having anything to do with verbs denoting states or relationships; yet the word involves a relationship prior to behavior. It is actually behaving properly toward and thus satisfying the One with Whom we are related. Now, just because he have relationship DOES NOT preclude the idea that we are pleasing to Him. This is made abundantly clear by the following verses – all of which attach God’s pleasure to our ACTIONS ‘in‘ relationship and not in the existence of the relationship alone. Notice that what creates pleasure in our relationship with God is our heart attitudes and our actions. The next verse in this passage offers two examples of things which are DIS-pleasing to God in our relationship with Him. So here we see that God is clearly NOT pleased with complaining and disputing. Notice that by refusing to engage in complaining and disputing we do not BECOME children, but we become blameless and harmless children. It is not a condition for relationship it is a product of relationship. Below, I have provided a list of verses with a brief commentary after each in order to illustrate the certainty of this teaching. In these verses I accentuate certain words for sake of clarity. Notice that pleasing God is mentioned as a GOAL to achieve, not a current reality attached to our relationship with Him. Notice also the purpose for pleasing God is because all His children will one day stand before the seat where Christ was judged for us. At that time, we will receive reward or loss for those good OR bad things we did while in our physical bodies. This is fully described in 1 Cor. 3:11-15. Notice that it was the action of giving to the support of ministers, which God found well-pleasing, not the relationship alone. Again, the ABILITY to completely please God is being attributed to our actions empowered by prayer. A “walk” (or life) lived in a manner worthy of our Lord is what fully pleases Him. Paul prayed for the church of Colossae that they might live a life worthy of God by bearing “Christ-like” fruit in their conduct and by coming to know God more intimately (increasingly). Paul uses his own actions as pleasing to God, as the basis for behavior which is well-pleasing to God in the Thessalonian church. Paul is saying… “If you will not flatter others, nor act with covetousness, or seek glory from man – but be gentle and affectionate, imparting the gospel as well as your lives, being blameless witnesses who exhort, comfort and encourage God’s children, you will be pleasing to God. Our being made complete (or mature) is realized in good works consistent with God’s will. These ACTIONS, Christ produces through our union with Him – is well pleasing to God. We DO the THINGS which are pleasing in His sight. Actions are here producing pleasure in God towards His children. In closing, I think it is a good thing to make something clear. It isn’t that God is not pleased with our being in relationship with Him…He is! It was by His good pleasure that He saved us and adopted us as His children. However, now that we are IN relationship with Him, His pleasure in us AS children, is directly connected to our actions which either prove or disprove our claims to love Him in response. As the scriptures tell us, “God is not mocked”. If we claim to love God, yet fail to do the things which are pleasing in His sight, then our claims to loving Him are false. Relationship is NOT one way, it is bi-directional. We love God BECAUSE He first loved us, but we ARE to love God. Jesus Himself said, “If you truly love Me, then you will make it your habit to keep My commandments” John 14.